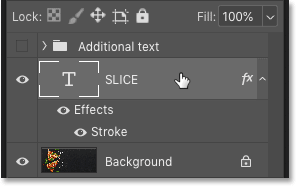 Learn how to slice text in Photoshop, and how to keep the text editable even after you slice it! For Photoshop CC and CS6. 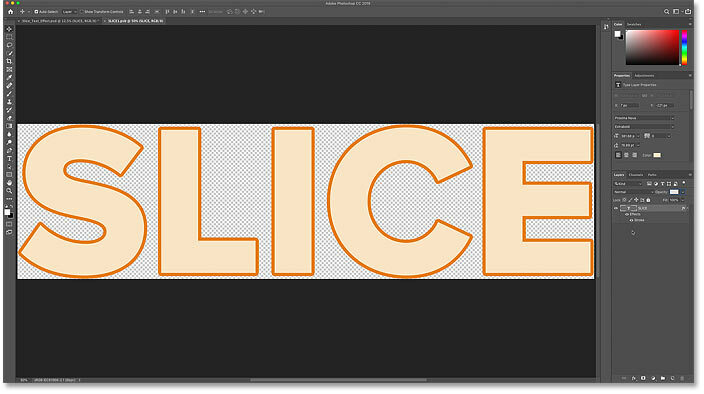 In this tutorial, I'll show you step-by-step how to create a popular "sliced text" effect with Photoshop. And unlike other tutorials that force you to convert your text into pixels before you cut it into slices, you'll learn how to keep your text editable so you can try out different words using the same slices! To do that, we'll take advantage of two powerful Photoshop features known as smart objects and vector masks. We'll start by converting the text into a smart object, which keeps it editable. And then we'll cut the text into slices, and shape the slices into any angle we need, using vector masks! Let's see how it works. I'll be using the latest version of Photoshop CC but you can also follow along with Photoshop CS6. The same sliced effect with different text. 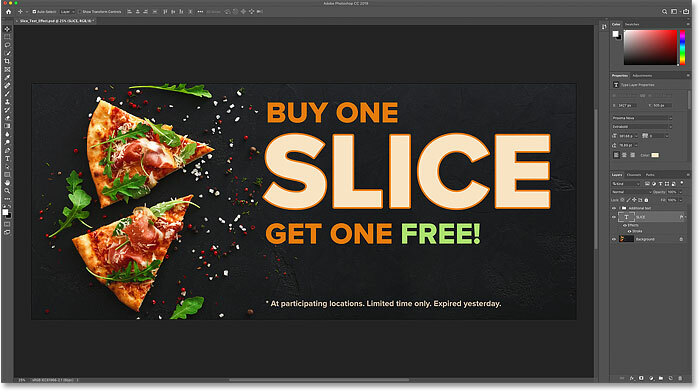 Hungry to learn how to slice text? Then let's get started! The initial Photoshop document with the text added. If we look in the Layers panel, we see how my document is set up. 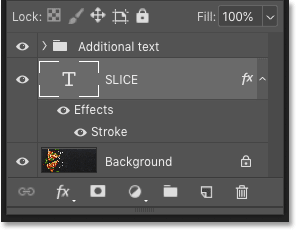 The main image is on the Background layer, and the word "SLICE" is on a Type layer above it. I've added a stroke around the letters, which is listed as an effect below the Type layer. The Layers panel showing the document setup. Turning off the "Additional text" layer group. The document after turning off the additional text. Photo credit: Adobe Stock. Selecting the Type layer in the Layers panel. Smart objects are indicated by their icon in the preview thumbnail. Setting the mode for the Rectangle Tool to Path. Drag out a rectangular path around the bottom half of your text. We're going to use this path to create the bottom slice. For best results, try to make the path wider than the text itself, so that if you need to edit the text later, and the new text is a bit longer than the original text, the new text will still fit within the slice. Drawing a rectangular path around the bottom half of the text. Now that we have our path, we'll reshape it into a diagonal slice. Selecting the Direct Selection Tool from behind the Path Selection Tool. Clicking away from the path to deselect it. Clicking to select the top left anchor point. Dragging the top left anchor point downward. Clicking Yes to turn the live shape into a regular path. Clicking to select the top right anchor point. Dragging the top right anchor point upward. What's the difference between vector shapes and pixel shapes in Photoshop? Holding Ctrl (Win) / Command (Mac) and clicking the Add Layer Mask icon. 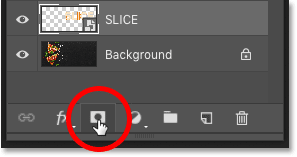 The vector mask thumbnail in the Layers panel. The first slice has been created. The Layers panel showing the smart object copy. Step 12: Choose "Subtract Front Shape"
Clicking the Path Operations icon in the Options Bar. Choosing "Subtract Front Shape" from the Path Operations menu. The top slice appears after choosing "Subtract Front Shape". Hiding the path by clicking in the document. It may look like our text is still in one piece. But you can turn the individual slices on and off by clicking their visibility icons in the Layers panel. Turning off the top slice. The bottom smart object holds the bottom slice. Turning off the bottom slice. The top smart object holds the top slice. 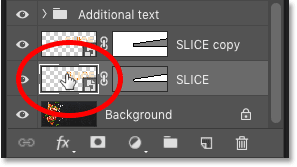 Choose the slice you want to move by clicking on it in the Layers panel, and then drag it into position in the document. Or, instead of dragging with the Move Tool, you can press the arrow keys on your keyboard to nudge the slice into place (you'll still need to have the Move Tool selected). Separating the slices using the arrow keys on my keyboard. Turning on the layer group. So now that we've created the sliced text effect, let's learn how to edit the text inside the slices. Even though we've created the slices using two separate smart objects, each smart object holds the exact same Type layer. 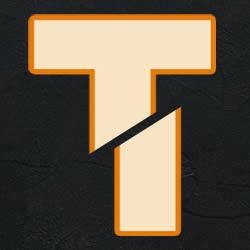 So if we change the text in one smart object, the same change will appear in both. Double-clicking on one of the smart object thumbnails. The text appears, ready for editing. Double-clicking to highlight the text. Replacing the original word with a new word. The new text doesn't fit on the canvas. The entire word is now visible after choosing "Reveal All". To accept the change and return to the main document, we need to save and close the smart object's document. And there we have it! That's how to slice text, and how to edit the text inside the effect, with Photoshop! Check out our Photo Effects and Text Effects sections for more tutorials. And don't forget, all of our tutorials are available to download as PDFs!